Welcome to HandAid.se - HandAid 1.3 is now available in English! The hand training images of HandAid are specially developed for those who work with hand rehabilitation. The program is a tool for composing individual training programs and can also function as a library for standard rehab programs. HandAid contains neither finished training programs nor images focused on specific diagnosis-groups, it simply consists of hand rehabilitation images that can be composed and designed into specific training programs. Each image is equipped with one instructive text for the patient, describing the correct movement, and one text for the caregiver about the exercise and how it should be performed. The patient instructions can be edited to suit each unique patient’s needs. It can also be excluded altogether if the training program is meant to contain only images. The images are drawn from the patient’s point of view as she performs the exercises. All images can be mirrored to always show the patient the correct injured side. The exercises are divided into categories depending on what part of the hand or arm they refer to. Images are choosen from the different categories and added to a rehab program. 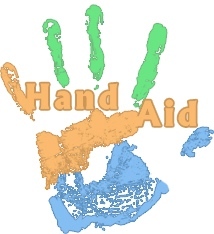 HandAid is currently available in English, Finnish, Norwegian, Danish and Swedish. The price for HandAid will be 190 Euros plus VAT. Click on "Watch Demo" to see a video demonstration of what the program looks like and what it can do. If you are curious about HandAid or want to know when it's released for your language, contact us.